Dr Nina OBULJEN KORŽINEK is the Programme Director of the forthcoming 7th World Summit on Arts and Culture, to be held in Malta (18-21 October 2016). Nina has an extensive experience as a researcher and academic in the field of cultural policies and cultural cooperation and has worked as an expert on various projects for UNESCO, Council of Europe, European Cultural Foundation, UNDP, European Parliament among others. In this conversation, Herman BASHIRON MENDOLICCHIO asked Nina to expand on the next World Summit topics and on different questions related to cultural cooperation, cultural leadership, networks and mobility. HBM: Let’s start talking about the next World Summit on Arts and Culture, which will be held in Malta this October 2016. The main theme and focus chosen for the Summit will be on Cultural Leadership in the 21st Century. Can you expand more on this? What are the main issues and ideas the Summit expects to discuss and analyse? NO: The title of the summit is: At the crossroads? Cultural Leadership in the 21st Century. We will invite summit participants – artists, cultural operators, representatives of cultural networks, policy-makers and researchers to reflect of the context in which today’s leaders operate. The idea is to discuss the pressing challenges at the global, national and local levels that are influencing arts and culture. How is cultural sector responding to these issues and who are the key players. HBM: We could say that nowadays the term leadership is highly questioned. In the social and political sphere, citizens and civil society movements are pushing for new models for sharing powers and responsibilities; while in the cultural sector we are experiencing the “golden era” of Networks. I would like to bring here the recent statement on “The Value of International Cultural Networks” – promoted by many of them – that states: “Our strength is our members, thousands of organisations and individuals, working together, engaging with communities, learning from each other, sharing experiences and resources”. In this sense, what is the meaning and role of leadership in today’s networked world? And, in relation to this, what do you think about the increasing importance of cultural networks? NO: In the description of the Summit programme we indicate that ‘Cultural leadership which understands and takes into account the changing realities of today’s world becomes fundamental for ensuring that the arts and culture are seen as pillars of social development in the 21st century’. We recognize that the concept of leadership used to be associated with the top-down approach. Today, leaders can no longer be identified solely based on their positions in political or governance structures, but rather on their ability to articulate a vision and bring about change. It is crucial to affirm also the role of artists, leaders of networks and advocacy groups or professional organisations, whether they are at the local or international level, to maximise the range of stakeholders involved in actively debating and proposing solutions for the contemporary challenges of the arts and culture sector. In this context, we highlight the role today’s communication channels and social media are playing in creating the environment where leaders can reach their colleagues, networks and professional organizations, audiences, decision-makers and general public more easily than ever and at unprecedented speed. In a time where the idea of participatory governance is fostered and promoted, no decision can be taken without the involvement of multiple stakeholders. You refer in your question to the increasing importance of cultural networks. The networks have been the dominating form of organizing and operating for cultural leaders for more than two decades. Even networks today are found at the crossroads. One of the Summit sessions will be dedicated to the future of networks. We ask the question if networks can provide a model of leadership that is non-hierarchical and thus better suited for the 21st century. HBM: According to its description, “The World Summit is the most important and longest running international gathering of professionals and practitioners involved in cultural policy and arts funding”. Beyond the worthwhile discussions and networking, what are –in your opinion- the major outputs and concrete results an international meeting such as the World Summit should achieve? NO: The Summit will feature some outstanding speakers. We have planned for a diverse and inspiring topics so I hope that this Summit will be as successful as the previous ones. While we know that the diversity of speakers and topics is the key for a successful Summit, I would say that equally important is the opportunity for networking as the Summit usually gathers up to 500 participants representing different parts of cultural sector – from policy-makers, representatives of funding organisations to national and regional networks, artists, professional organizations and academics. In this context it is indeed a unique event. HBM: Your main role in the Summit is the one of Programme Director. Can you tell us something more about the structure and the programme of the Summit? NO: As we have already mentioned, the focus of the 2016 World Summit on Arts and Culture, will be on Cultural Leadership in the 21st Century. The arts and culture can be considered to be at a crossroads – faced with many challenges and opportunities at the global, national and local level such as: the impact of new technologies on the production and distribution of cultural goods and services; threats to global security; new patterns of migration; changing contexts at the national level including austerity measures and continuous requests for reform; aspirations from artists and culture operators to extend their impact and outreach to other sectors, while also struggling to guarantee freedom of expression and ensure cultural diversity. In the first part of the summit we will ask the question where are we and how did we get here. The idea is to discuss which are the issues that have brought us to the crossroads and who are the key drivers of change. We also ask the question who are today’s leaders. In the second part of the summit we intend to look ahead. We are inviting speakers and participants to share their visions for the future. Throughout the Summit we hope to have many speakers who will share interesting and exciting stories about their ways of dealing with the pressing challenges and moving arts and culture sectors ahead. HBM: Another keyword of the meeting is “crossroads” and Malta, the hosting country of the 2016 Summit, represents a very central and peculiar location at the crossroads of the Mediterranean. The reflections around the value of cross-cultural encounters, cultural diversity and intercultural dialogue, as well as the need to improve and enhance the role of cultural cooperation, are central issues in today’s cultural policies, both at national and international level. What is the approach of the Summit towards these urgent issues? NO: I really can’t think of a better place to hold the Summit. Malta has been at the crossroads of cultures for centuries. Maltese culture is so diverse and unique; it shows the richness that cultural exchanges and intercultural dialogue can create and can bring to a country, to a nation. It is a modern European state which is developing in a very interesting way. At the same time, Malta is a very small country that is receiving a significant number of refugees from North Africa. Meeting in Malta will also give us an opportunity to reflect on these tragic developments and once again ask ourselves how can art and culture contribute to overcome current crisis. 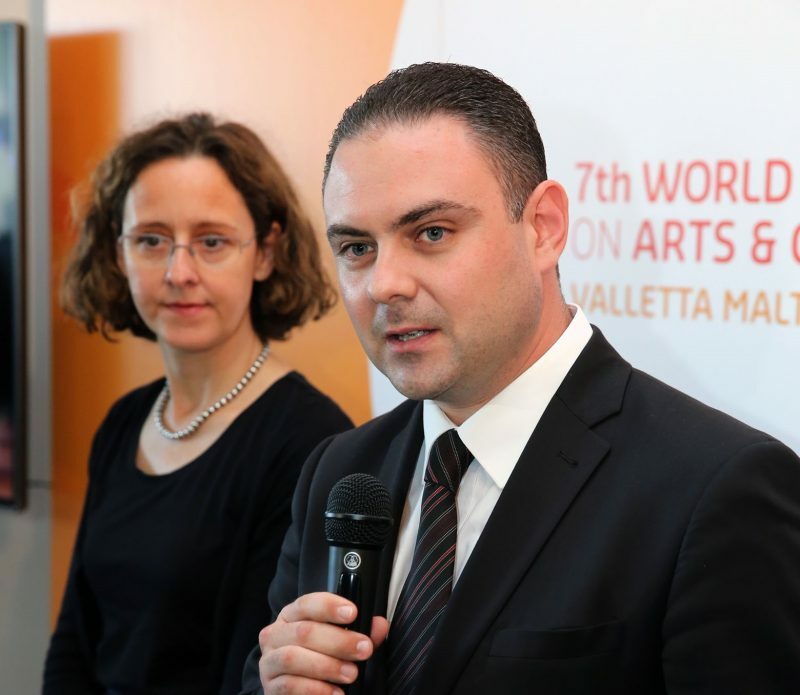 HBM: Valletta, Malta’s capital city, will be European Capital of Culture in 2018. What do you think about the ECoC model? What other relevant strategies and models could be planned in order to improve the cultural life of cities and the cultural connections between different areas? NO: This is another topic that we will discuss during the Summit – not the project of European Capital of Culture itself but in general, the role of cities and local governments as agents of change. The fact that Valletta will be the European Capital of Culture in 2018 contributes to the growing number of events that are taking place in and around Malta. This is certainly another incentive that attracts people to Malta and to the Summit. Besides the European Capital of Culture project that has been running for thirty years and that will be discussed in one of the sessions, we will also invite representatives of the Agenda 21 for Culture to talk about the role of the city and the emerging importance of cultural leadership at the local level. HBM: As Programme Director of the World Summit you are certainly aware about the different cultural ties and connections between regions and continents. What are, in your view, the new directions and routes of cultural cooperation at global level? And, more specifically, how do you envisage the current development of cultural cooperation between Asia and Europe? NO: How to respond to such a question in just a few lines. Cultural exchanges between regions and continents are multiplying to unprecedented scale. This is also the case with the cultural cooperation between Asia and Europe. However, if we analyse these exchanges we see that there is still much space for improvement in the context of aiming to make such exchanges more balanced. While everything seems to be easily available, especially with digitally distributed cultural goods and services, I still think that we need to invest in promoting cultural cooperation – through national, bilateral, regional and international organisations and projects, such as, for examples, through the work of the Asia-Europe Foundation (ASEF). HBM: In order to conclude, I would like to ask you a question focused on cultural mobility, that is one of the rising and most discussed topics in the field of art and culture. Supporting the mobility of artists and cultural professionals is a key issue in most of the official documents of international cultural institutions; still there is a lot of work to do in order to overcome the existing obstacles (especially in relation to Visa issues and South-South exchanges), increase funding, promote diverse mobility programmes and improve its general conditions. What are your thoughts on that issue? NO: Many networks and organizations are involved it the promotion of mobility through various funding schemes, travel grants, exchanges or artists-in-residence programmes. We all know how important mobility is for cultural cooperation thus existing programmes continuously need to be complemented with new projects and initiatives. The question of mobility is often discussed in the context of the implementation of the UNESCO 2005 Convention on Cultural Diversity in particular the provisions on preferential treatment. There is a need for intervention in order to enable artists and cultural professionals to travel because too often there are obstacles for those coming from countries with lower income or higher percentage of immigrants. I hope that in the years to come, policy makers and funding agencies will be investing more and more into mobility.